This week, besides the regular Torah portion, there is an additional reading called Parshas HaChodesh, which concerns the Commandment to establish Jewish months according to the cycles of the moon. This is the first Commandment given to the Nation of Israel. The moon has a deep, symbolic connection to the Jewish people. The Talmud says: “And to the moon He said that it should renew itself as a crown of glory for those He carries from the womb, for they are destined to be renewed like it, and glorify their Creator for the honor of His kingdom” (Sanhedrin 42a). “The Jewish people, who count by the lunar months, are ‘those He carries from the womb’ — because they, too, are destined to be renewed in exile, and glorify their Creator” (Rashi). Chazzan Sherwood Goffin, of blessed memory, the beloved cantor for Lincoln Square Synagogue (LSS) for over 50 years and a close friend of Project Genesis, passed away this past Wednesday. Rabbi Uri Goffin, a member of our team a number of years ago, is his son. In his eulogy, Rabbi Shlomo Riskin, Rabbi Emeritus of LSS and a close friend of the Chazzan, cited the lyrics to one of Chazzan Goffin’s favorite songs, “Ah Sukkuleh.” In this Yiddish classic, a young girl sees the family’s Sukkah battered by the winds and cries to her father, “The Sukkah is going to fall!” The father tells her not to fear, and assures her, “It has stood for 2000 Years and hasn’t fallen yet!” Rabbi Riskin said Chazzan Goffin came to lead a small, fledgling synagogue 50 years ago. 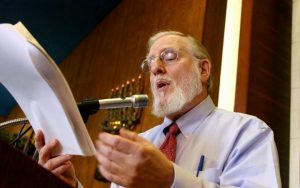 The congregation knew very little about authentic Judaism at that time, yet with Chazzan Goffin’s guidance, lifting people’s spirits with his friendship and song, LSS grew to the spiritual Torah center of many hundreds of families that it is today. He was the devoted servant of his Creator and his congregation. Through his sincere love and melodious service he kindled the Jewish spark of everyone he touched. While in exile, the Jewish people are handicapped by their dispersal throughout the world, and their distance from the holiness of the Land of Israel and the Holy Temple. Yet, like the Sukkah, despite our nation’s fragility, we withstand the ravages of history — indeed, as Jews we flourish even in the dark days of exile. This nation, the crescent that still shines, is sure to grow once again to its full radiance. Chazzan Goffin certainly did his part to help every congregant to grow and shine. We will miss him dearly. May his memory be a blessing.